03-36. In Kharkov, on the anniversary of liberation from German fascist invaders a march with a 30-meter-St. George's ribbon took place. Also a public rally was held in support of the liberation of the South-East. Several people were detained by police officers for "walking with separatist symbols" - meaning the flags of New Russia. 02-22. Press service of Gorlovka and Slavyansk Diocese. "In Kirovskoye as a result of a direct hit of a shell a cathedral destroyed, there are victims. 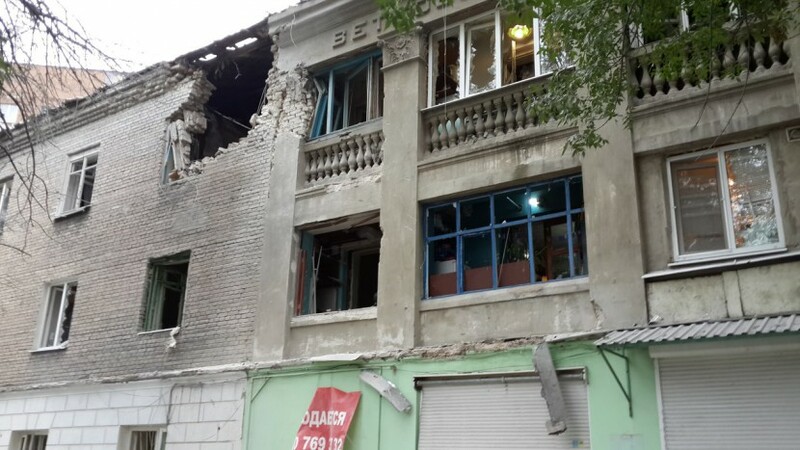 On August 23, the shell hit the cathedral of St. John of Kronstadt in Kirovskoye. 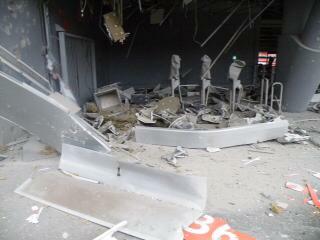 The temple is completely destroyed, three people were killed and several more taken to hospital with serious injuries. In the same bombardment a shell hit the hospital, where there are also two deaths and serious injuries. " The night was tense, from 4am till 9am (GMT) there had been great restlessness near Novoazovsk, Ukrainian artillery had been carrying mortar and howitzer fire on Novoazovsk customs, and late at night they used MLRS. There is no information about the devastation and casualties. In the beginning of the night explosions around Mospino were heard. 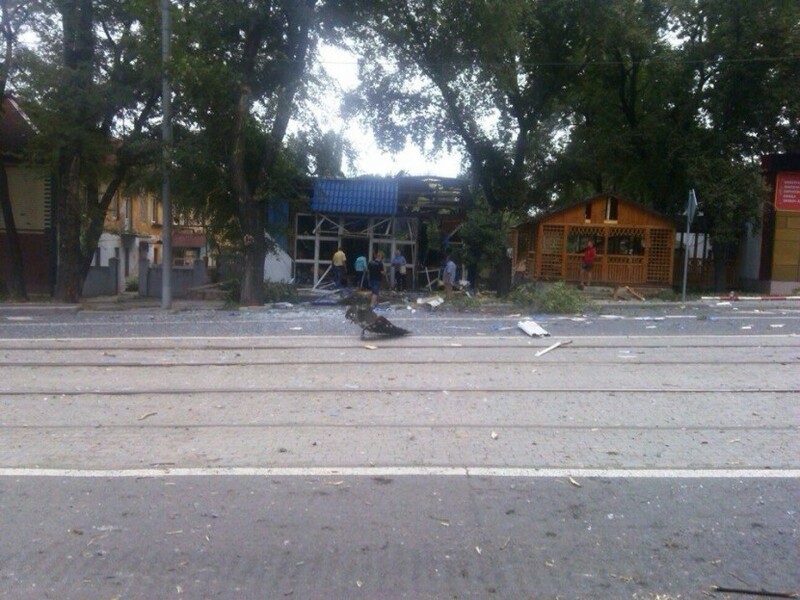 In the morning blowouts in the Kirovsky district were heard, bus station on Trudovskikh Str. was damaged, low-rise buildings of residential sector suffered, at least three people were killed. 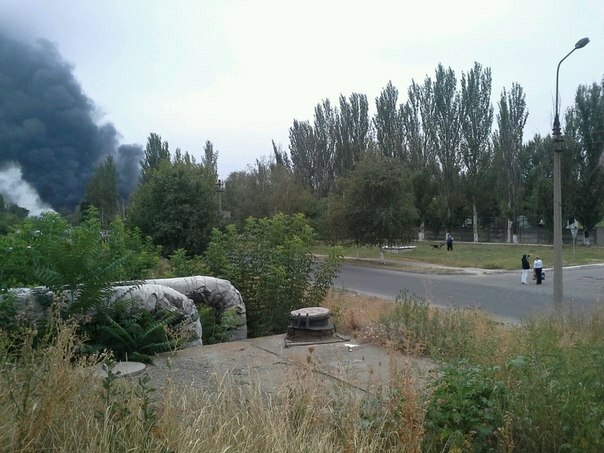 At about noon (GMT) mortar attack at the checkpoints of Novoazovsk customs (on the «fork») has resumed by units of UA. As a result of the night and morning shelling one of the Novoazovsk customs service checkpoint has been completely destroyed, workers of the border service were sent on vacation for an unknown time. Judging on the destroyed checkpoint, the junta is preparing provocations against civilians of Azov. Many guards say in conversations that the fire was friendly and they are very depressed by this fact. 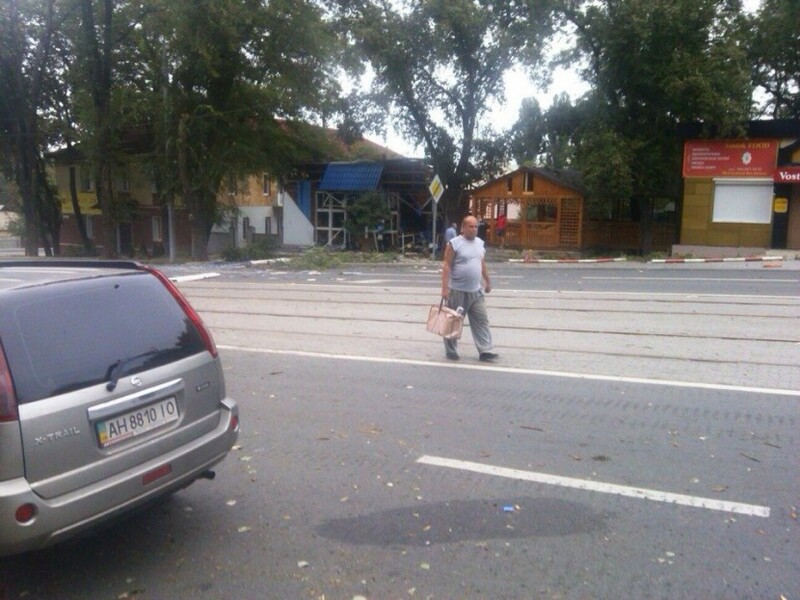 Around the same time in the area of ​​Kalininsky market distant explosions were heard, presumably from Ilovajsk. By 13-00 (GMT) the sounds of battle on the outskirts of Donetsk were heard. 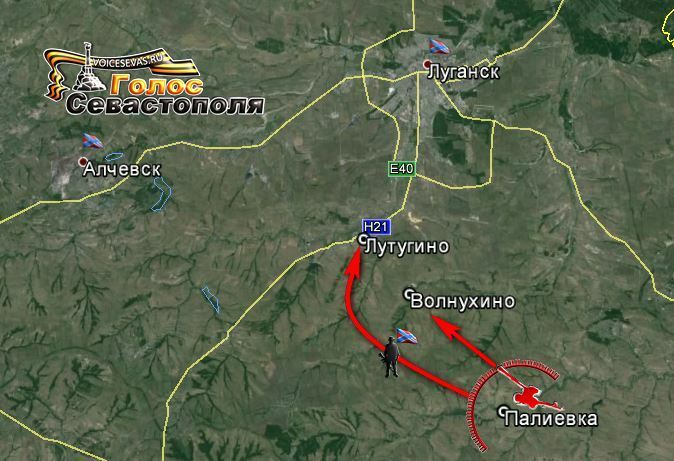 Junta continues transferring of the Nazis units in the direction of Donetsk. Information received about upcoming military echelons from the Kharkov area to the combat zone. Today, due to the work of our RSGs, a railway line on the Kharkov railway in the direction of Donetsk has been disabled, the junta is engaged in restoration work, thus the timetable was broken and a military train with ammo detained. In the area of ​​the village Lisichie (Amvrosievsky district) there is a high-intensity maneuver fight, in the battle area smoke is observed, fascist machinery is burning. UPD: 16:35 (GMT) in the Kievsky district there are audible explosions. UPD 1: 16:45 (GMT) also shelling conducted by junta artillery divisions at the Kalininsky district, at Shchetinina Str., Proletarka Str., Gvardeyka Str., area of Motel and Brewery (supposedly), fire comes from the airport. UPD 2: 16:55 (GMT) in the area of ​​the Motel black smoke is rising. UPD 3: 17:30 (GMT) In the outskirts of Makeevka there is fighting with enemy RSG who have shelled Makeyevka with mortars. 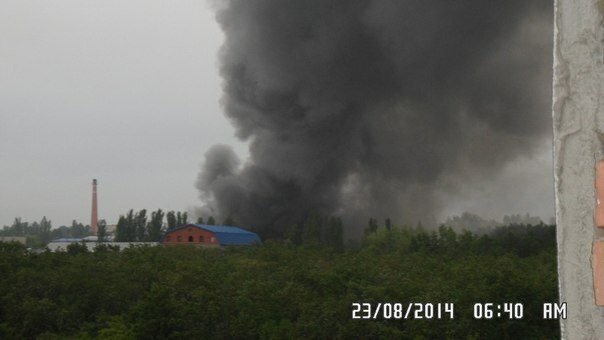 UPD 4: Donetsk is being subjected to shelling so far. Now it is known for certain about six killed including a child of 12 years old, another child of six injured, there is at least one more wounded. In Novoazovskiy district the situation is heating up. UPD 5: Near Severodonetsk under the checkpoint Smolyaninovo there has been a fight between the militia and the Nazis for over three hours. 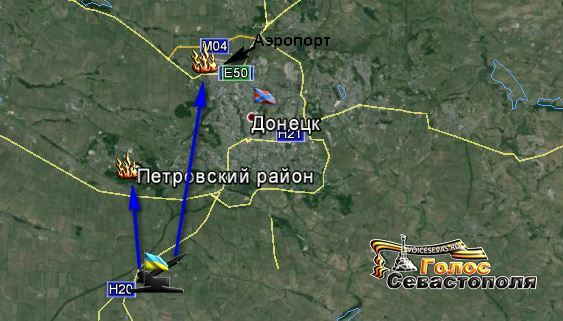 Over Donetsk the UAV continues to be used. 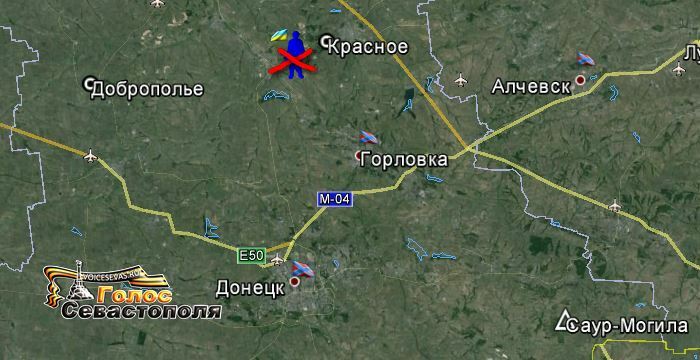 UPD 6: 01:00 (GMT) junta resumed shelling at Donetsk with howitzer artillery. 01-08. As a result of successful ambush actions of the militia intelligence groups in the area of the village Starobeshevo column of the 72th mechanized brigade logistical support advancing in the direction of Andreevka was defeated. Direct hit destroyed trucks with ammunition and fuel. Cars with food and fuel were captured. Three enemy soldiers killed, one captured. 00-48. In the area of the village Krasnoye militia counterintelligence discovered and defused subversive and intelligence group of the 25th Airmobile Brigade consisting of 6 persons. The group had been operating under the guise of local residents. Saboteurs, traveling by minibus "Volkswagen Transporter", were conducting reconnaissance and carrying out attacks on posts and small columns of militias. During the skirmish three commandos were killed, the rest were captured. At the moment the prisoners are delivered to the Department of Counterintelligence of DPR Army Chief Staff of. Their questioning is carried out. 23-50. Artillery of DPR militia punitive stronghold eliminated near Vasilievka. There are one of ACVs destroyed and 12 people killed and wounded. 23-21. Under persistent pressure from the militia forces the Nazis began to withdraw their units from the positions in the area of ​​settlements Torez and Snezhnoye (Donetsk People's Republic). 22-30. According to inhabitants of Donetsk, at about 22-00 punishers began shelling presumably at Petrovsky district with MLRS "Grad". 20-59. Information for 18.00 from the City Council of Donetsk. 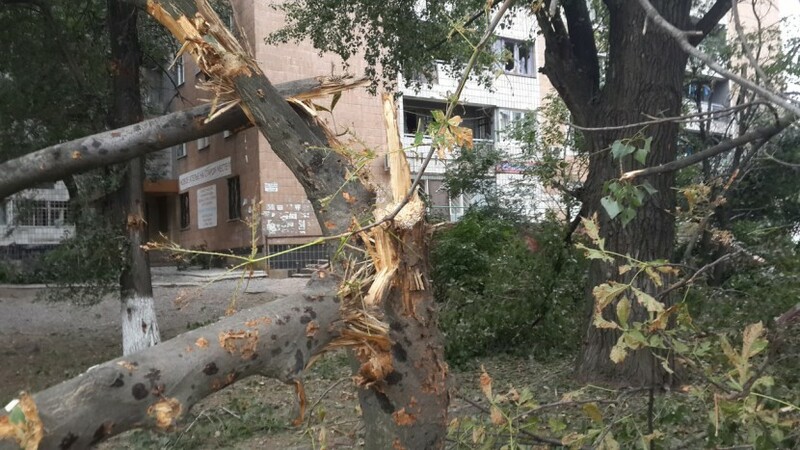 In the afternoon, Donetsk subjected to heavy artillery shelling again. The Kalinin and Petrovsky districts affected significantly. 20-13. 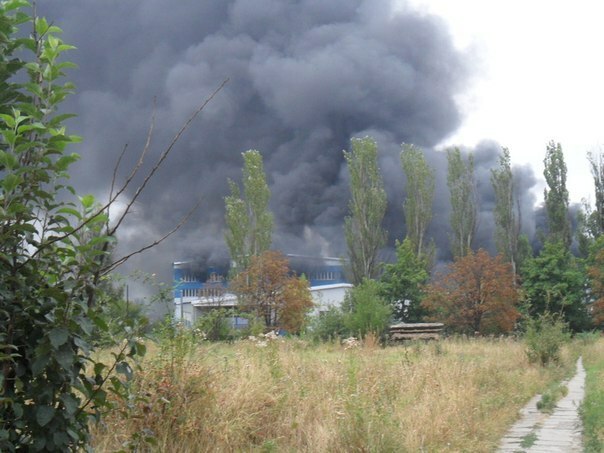 In Donetsk, on Saturday, August 23, at around 18:00 (GMT) there was a fire of the area of the bus station "Motel" on Krasnogvardeiskoye highway and the Pokrovsky market. In their turn, the Donetsk People's Republic militiamen on duty at the checkpoint near the "Motel" claim that the firing had targeted at them, the checkpoint did not suffer. 19-44. 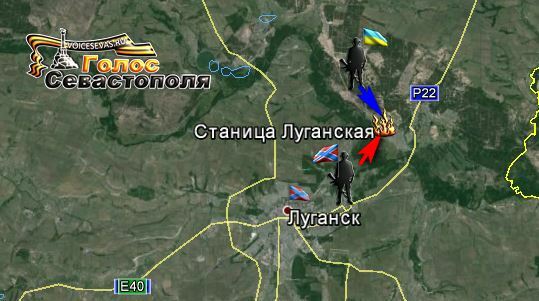 Near Kuteynikovo punitive positions were fired from Uragan. In occupied by punishers Dobropolie partisans encroached a local chief collaborator - Valentin Krifalushi. Explosion on self-made explosive device - shot in the head. It seems to be getting hot for the invaders and their hangers-on. Partisan sally is reported to be in Slovyansk. 18-15. Amvrosievka is de-energized as a result of the fighting. At night a guards squad on the APC and the National Guard convoy were brought down - a lot of victims and destroyed equipment. 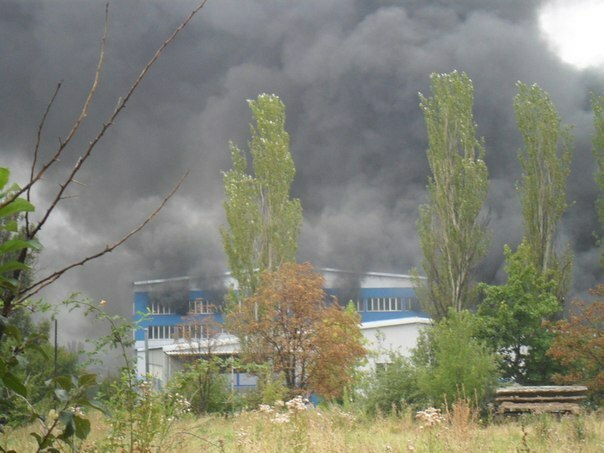 Also the rear of the Vasilievka (south of Novy Svet) and Telmanovo have been fired. 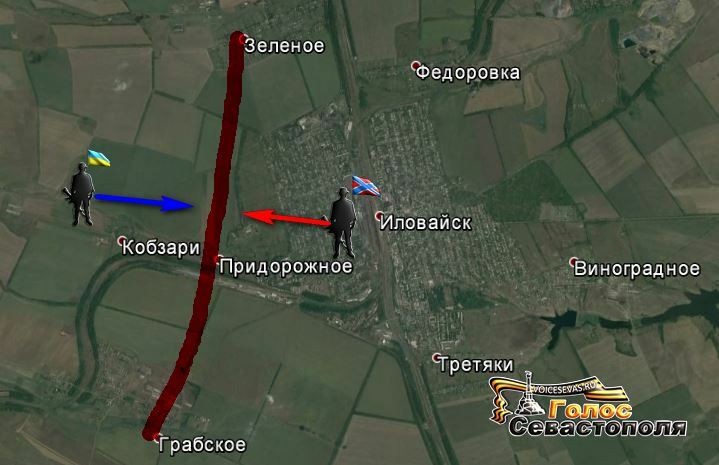 Now there is fighting in the area of Uspenka. 17-45. 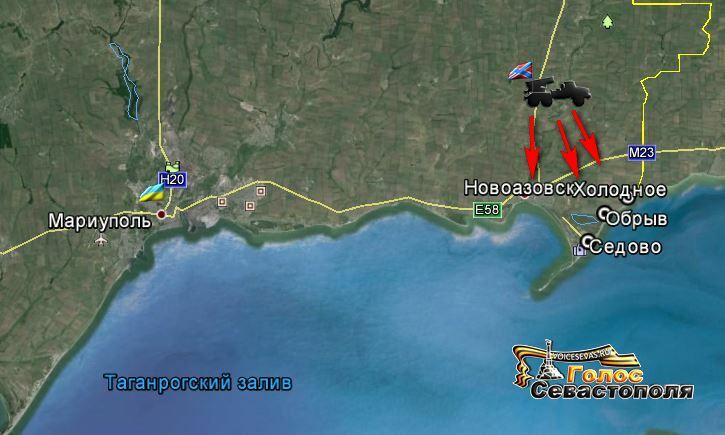 Militia is fighting in the area of Novoazovsk and village Sedovo. A firing is in villages Kholodnoye and Obriv. In Mariupol bomb shelters are being opened. At night bombardments of the territory adjacent to the checkpoint Novoazovsk were conducted and resumed again at 11.30. 16-42. Messages from the militia. 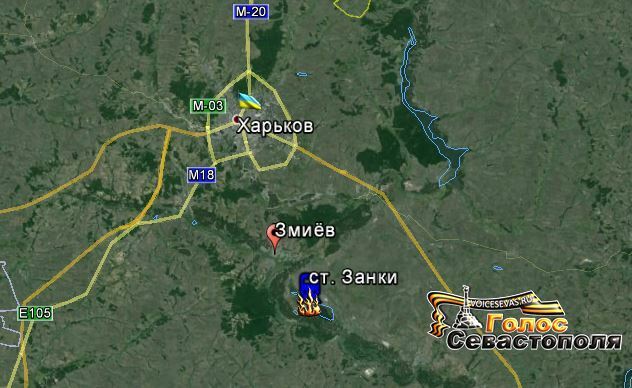 The hot spot is now under Ilovaisk. The total number on side of Ukrainians up to 4,000 people, on the militia’s - up to 1,500 people. In Stanitsa Luganskaya street fightings do not stop. The UA has patients from the local hospital as captives. Ukrainian forces stretched their positions very much. Intelligence warns of the heavy fighting. On the part of UA foreign mercenaries will be involved. 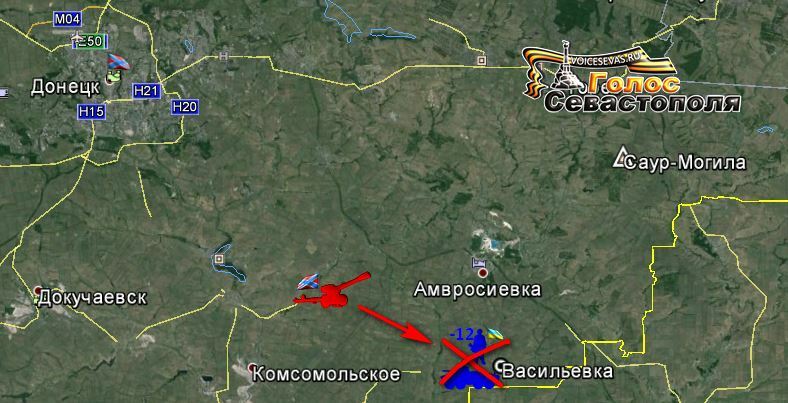 The reinforcement of UA also directed to Amvrosievka. A parallel attack and advancing to Saur-Mohila are possible. Militias are ready for battle at Saur-Mohila. There is enough force for that. In this area, a sufficient number of armored vehicles belong to the militias. 15-45. Militia RSG bypassed settlement Volnukhino from the settlement Palievka and hit at Lutugino. The settlement Volnukhino itself is under the gun of the militia forces. 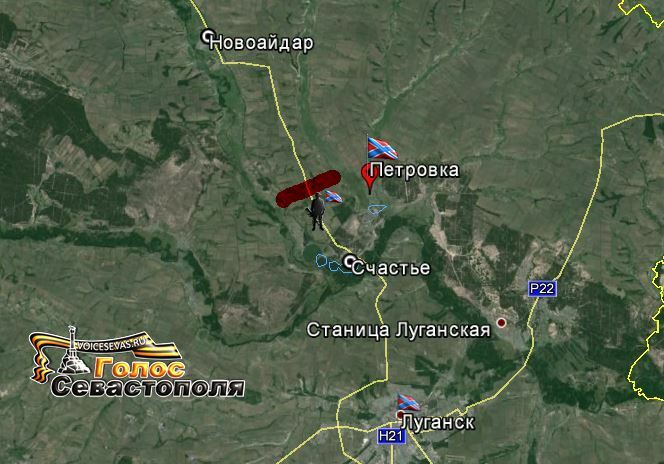 Massive attack of militia began at Uglegorsk at 13.59 (GMT). 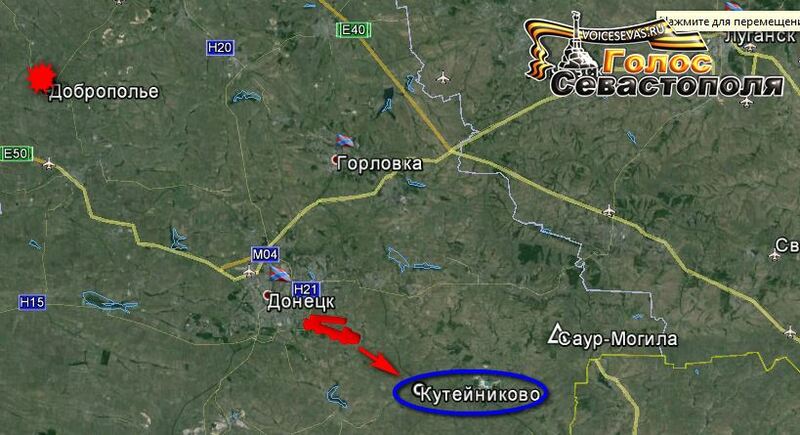 Petrovka to the north of the town Schastye is already in the militia’s hands. By the way, without a fight. 14-03. 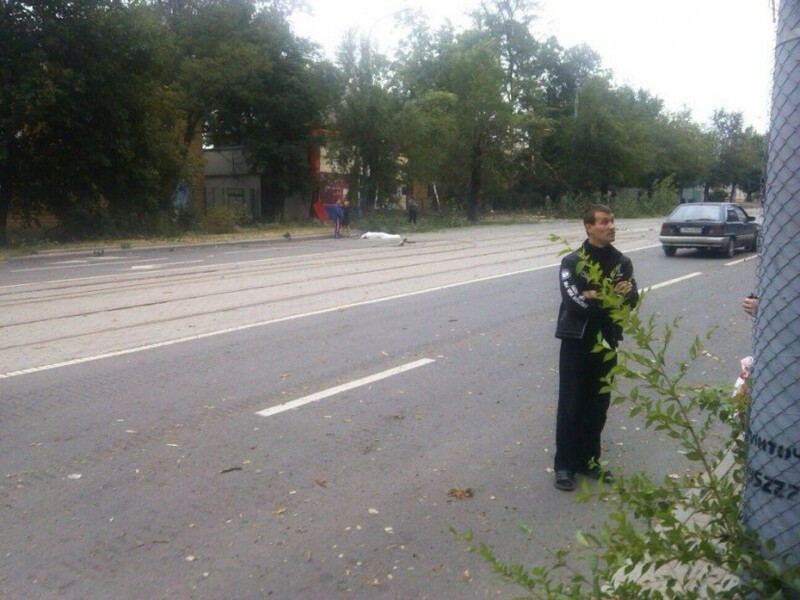 In the Kharkiv region on the railway near the station Zanki (Zmiiv district) there was an explosion. 13-39. 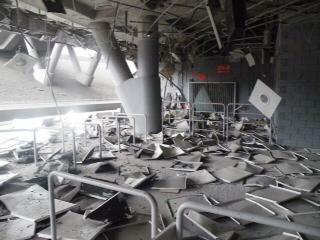 At 7 am (GMT) on the "Donbass Arena" sounded two powerful explosions. 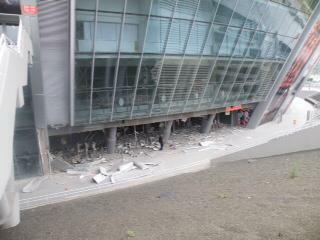 As a result of hits numerous damages inflicted at the north-western facade of the stadium, communications, equipment and detached building of energy center, located in the northern part of the «Donbass Arena» park. 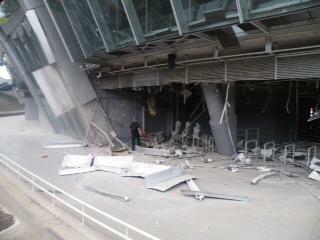 No employee of the stadium was injured. Press office of FC "Shakhtar". 13-06. Ilovajsk. Street fighting on August 23, 2014. Video. During the night of August 22 to 23 the enemy had been continuing shelling of residential areas and infrastructure suburbs and outskirts of Donetsk and Lugansk. Units of the People's Militia conducted active military operations in the area of ​​settlements Krasny Luch and Anthracite. Separate clashes with the punitive troops took place in settlements Bolshaya Vergunka, Stanichno-Luganskoye and Malonikolaevka. During the heavy fighting near Petrovskoye Southeast Army soldiers have destroyed one tank, three infantry fighting vehicles, armored personnel carriers, and up to ten punishers, they retained their positions. On the outskirts of Marinka militia units brought out of service two armored personnel carriers and three howitzers D-30. 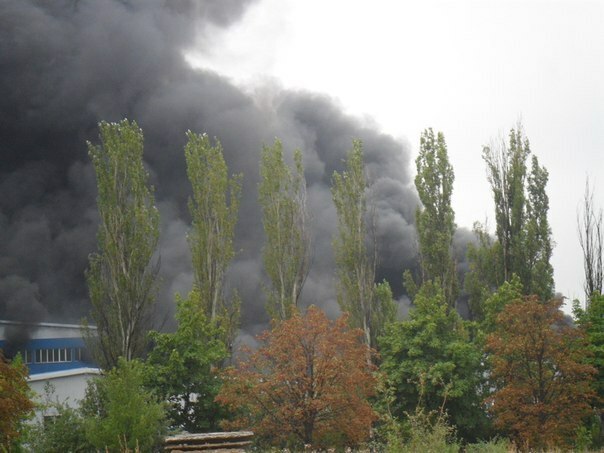 Near the Donetsk airport artillery battery was suppressed, which led harassing fire at residential quarters. One gun with the detachment destroyed. Four enemy tanks were knocked out under Krasnogorovka due to sudden and decisive action. In areas of Novoannovka, Pridorozhnoye, Semeykino and Samsonovka Southeast Army counterintelligence identified four sabotage and reconnaissance groups of the enemy, acting under the guise of local residents. One commando team destroyed. Two commandos captured. 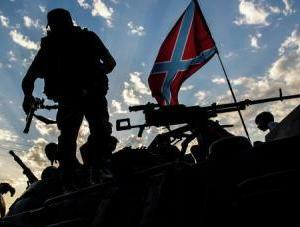 Units of the Army of the Southeast captured checkpoint "Uspenka." Now there is a fierce battle in the Avilo-Uspenskoye. Away from Marfinka National Guard checkpoint had been destroyed in the shelling. Two infantry fighting vehicles and up to ten punishers destroyed. The use of missiles Tochka-U on positions of militia recorded in Snezhnoye and residential quarters in the city Rovenki. 12-04. 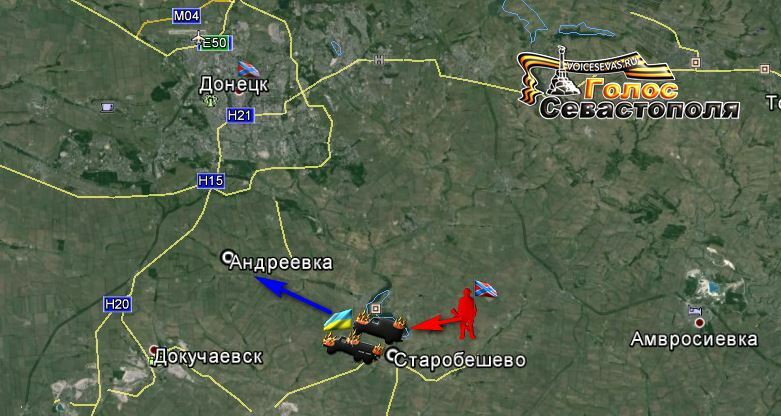 Reports from the settlements Zelyonoye and Grabskoye under Ilovaisk. Division of the commander of Donetsk militia "Senya" destroyed the enemy ICV. 11-35. Donetsk. The fifth section. Kievsky district. There are two killed found (2 more are possble). As they say, shooting was from Avdeyevka. 11-04. Night of August 22 to 23 was in Donetsk relatively quiet. Ukrainian army continued shelling of bedroom suburbs of the city: Petrovsky district, area at the airport, and fired from Mariupol track. But any offensive of security officials is possible to talk about. 10-36. Humanitarian convoy is returning from Ukraine. Several dozen trucks from the Russian humanitarian column left Ukraine through the checkpoint "Izvarino" and are now on the frontier point "Donetsk" in the Rostov region for inspection and clearance, RIA Novosti reported with reference to its correspondent. 10-00. Donetsk. Morning. Regular attacks. Photos from a witness. 09-33. All night long shelling at Yasinovataya continued. Ukrainian soldiers have been shelling the city with mortars and howitzers of large caliber. Sometimes the noise of «Su» is heard somewhere. Residents are in bomb shelters nearly all the time.